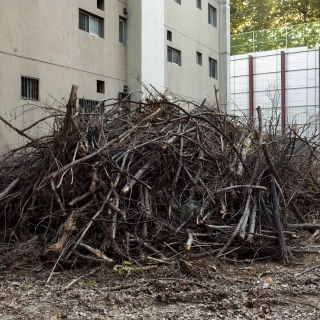 “Between 2016 and 2018,” Jinyoung Kim recounts, “I have chosen to go to places that are subjected to urban-renewal projects targeting Jugong Apartments—state-funded development sites from the 70s and 80s—in outskirts of Seoul, South Korea to document their protocols of disappearance. One of those places, I knew and remember like the back of my hand. When it began to disintegrate, I observed the steps of its estrangement. People left, garbage and stray cats populated the place. Then the trees, playgrounds, benches, and streets disappeared block by block. Like a climax, the buildings were demolished one by one. In less than a month, the place became a space.” In APPARITIONS OF COLLECTIVE DISPOSITION, Kim documents this change and the emotional impact the deterioration has had on her, all the while asking one question: When one cannot revisit a place, would memory survive the time? Jinyoung Kim uses time-based media to create her works. Her photographs and videos combine documentary and fiction in order to form metaphoric narratives that deal with questions of identity, sense of belonging, and the relationship between place and self-perception. Born in South Korea and raised in Canada, Kim’s work reflects on her own experience of having to grow roots in both places. She continues to look for stories in her life and other's lives as an ongoing investigation into how a sense of place relates to the formation of one's identity. Kim renders personal narratives into poetic vision forming symbolic and metaphoric visual condensations. Her images and videos resonate with everyday experiences, imbuing them with meaning through appropriation into different contexts and staging gestures in front of the camera. Jinyoung Kim holds a BFA from OCAD University in Toronto, and received her MFA from Concordia University in Montréal. She has exhibited her work during Momenta—Biennale de l’image 2017, at Volta Basel 2018, Papier 18, Papier 19, VENDU—SOLD, and at galleries across Canada including: Leonard & Bina Ellen Art Gallery; VU Photo in Quebec City; Gallery 101 in Ottawa; Maison de la Culture Frontenac in Montréal; Montréal’s Espace Cercle Carré; and internationally at the Focus Photography Festival in Mumbai, India. Kim is a finalist in this year’s Prix Pierre-Ayot and was shortlisted for the 2014 Claudine and Stephen Bronfman Award in Contemporary Art. She also received the Roloff Benny Foundation Fellowship in Photography. Her work has appeared in ESSE magazine, Vie des arts, La Presse, and Le Devoir. Kim’s work can be found in the collections of the City of Montréal, Hydro Québec, and in numerous private collections. Places in a city shape lives and die young. At 34 years old, I once belonged to places, but perhaps those places do not belong to me. The relationship is never reciprocal. Similar stories go on. Renters float around the city like particles of industrial dust, moving to and from another neighbourhood, and gets attached to a tree and calls it a place. One day, the tree falls by a spell of a shapeless phantom that guards the future of the city, the state, the numbers. The story repeats itself for another case. Between 2016 and 2018, I have chosen to go to places that are subjected to urban-renewal projects targeting Jugong Apartments - state funded development sites from the 70s and 80s - in outskirts of Seoul, South Korea to document their protocols of disappearance. One of those places, I knew and remember like the back of my hands. When it began to disintegrate, I observed the steps of its estrangement. People left, garbage and stray cats populated the place. Then the trees, playgrounds, benches, and streets disappeared block by block. Like a climax, the buildings were demolished one by one. In less than a month, the place became a space. My memories of the place were concluded by the sights of deterioration. The sight is almost cathartic. Images of the disaster zones act as a self-fulfilling prophecy to what expectations I had of its loss. I found that I identified with the place by referring to the images that I vaguely remembered from news reports and Sci-Fi films I saw rather than from my personal memories. I realized that when I walked into the demolition zone, it was a non-place, an impersonal space. It failed to bring out memories that were once so strongly attached to it. When one cannot revisit a place, would memory survive the time? Future is here with a case of amnesia. The artist wishes to thank Kevin Jung-Hoo Park, Garnet Dirksen, members of Outre-vie/Afterlife, and Han Jin Lee for their support in production of this project. Also the Canada Council for the Arts for their generous financial contribution, and Milieux Institute’s Post-Image Cluster for their institutional support.